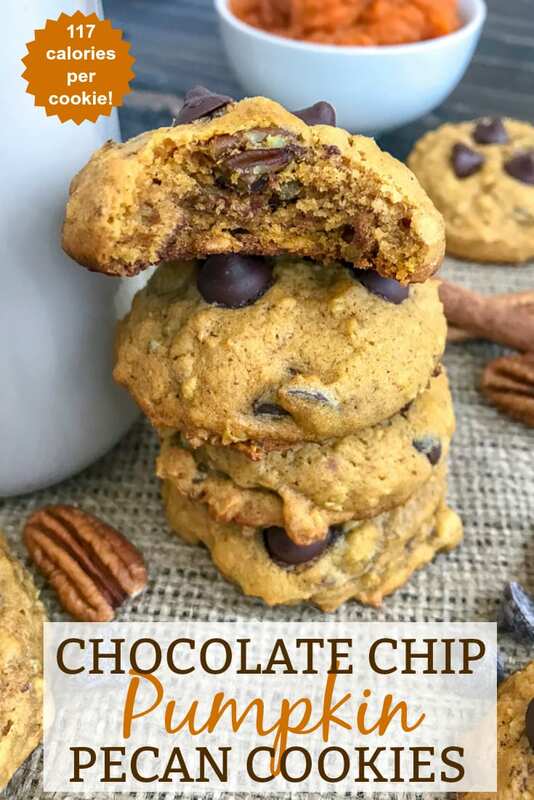 You are going to absolutely love these Chocolate Chip Pumpkin Pecan Cookies. 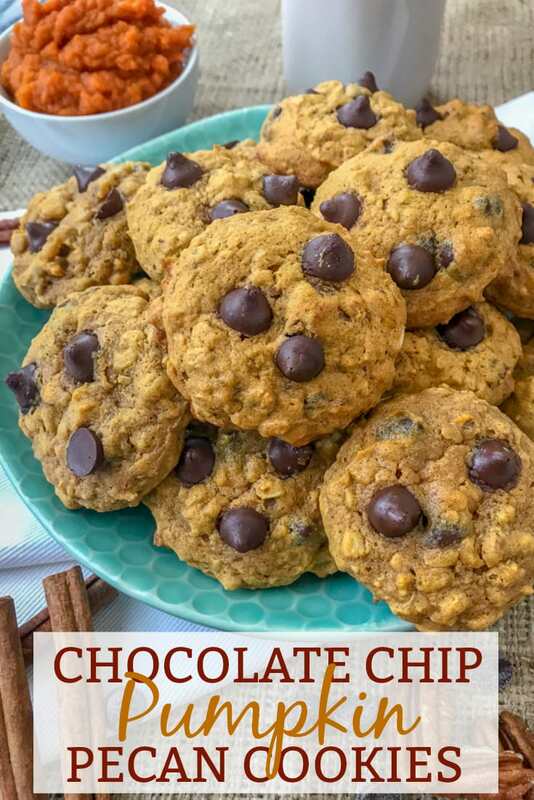 A soft, moist cookie with the perfect hint of pumpkin flavor, while being loaded with oats, chocolate chips, and pecans! 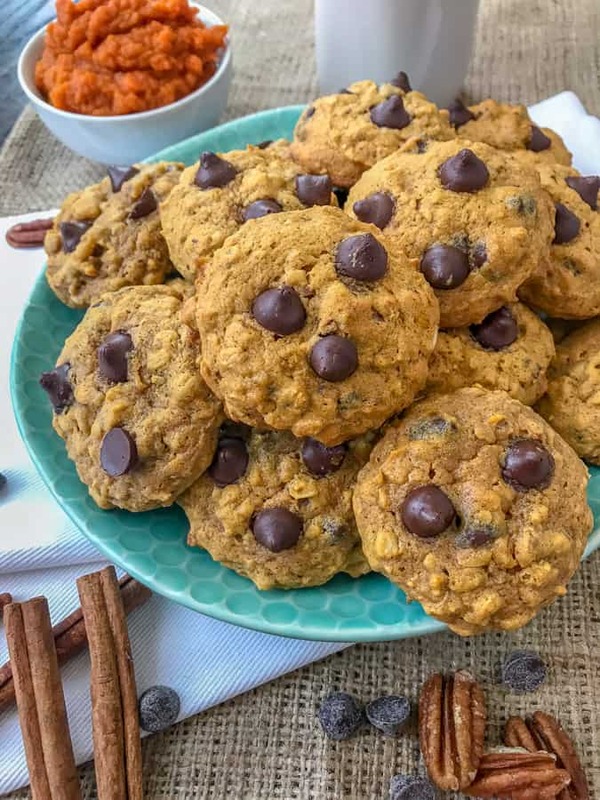 These cookies are thick and chewy, loaded with pumpkin spice, and rich with flavor. Crispy around the edges, but chewy and soft in the center – like a cookie should be! They make for the best after school snack, breakfast on-the-go, or as a just because treat during the holiday season. ONLY 117 CALORIES PER COOKIE! I woke up with a sweet tooth this morning which is what led me to creating these cookies. Ok, let’s take a step back… I have been experiencing a sweet tooth for quite some time now. I do my best to curb my sweet tooth cravings, as my waistline is not very forgiving when I indulge too much. And with the holidays in full swing, it’s even more vital to keep myself in check! 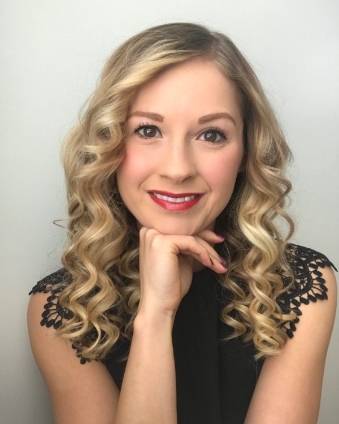 I know when I head home to see my family for the holidays, there will be platters and platters and platters of goodies at my in-laws, as well as every place I have scheduled to attend. HA. So with wanting to take something I know my entire family and the little ones will love, I got to work. 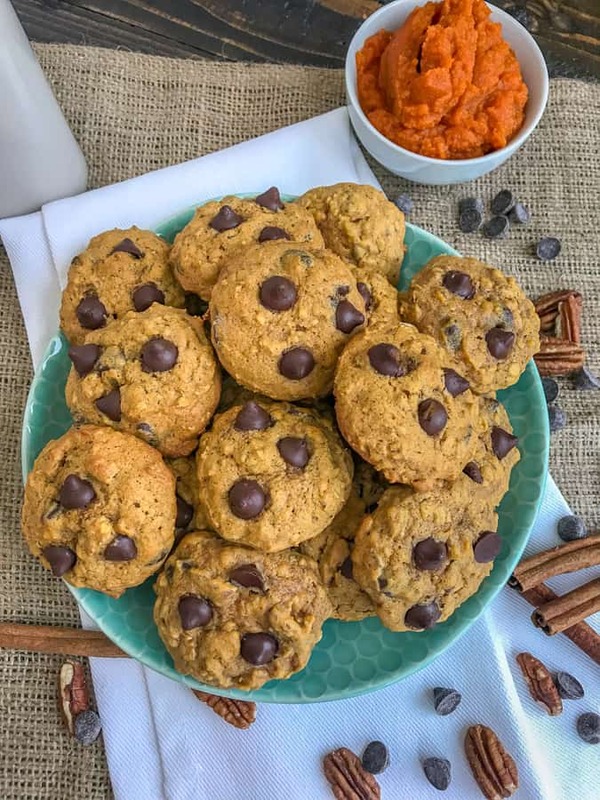 I used the base to my Pumpkin Cake Cookies to create these and I was not disappointed. Guaranteed you won’t be either! Anyone else agree?? Heck, I love any kind of cookie so long as it is on the softer side. I have never really cared for the crispy cookies. But I love those brownie brittles you get in a bag. Makes sense, right? No, I know I never do. My poor husband can attest to that! 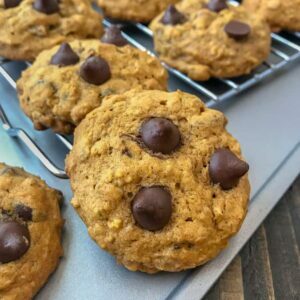 These cookies are loaded with just the right amount of pumpkin and brown sugar flavors, while also being loaded with old fashioned oats, chocolate chips, and pecans. There’s just something about a cookie with nuts in it – whether its walnuts, pecans, almonds, or macadamia nuts. I’m clearly not picky! Although I have yet to try one with pistachios in it. Am I missing out? On the pistachio ice cream, too? I’m curious, but also very apprehensive. Ha. Very easy and quick to throw together. Chewy and soft in the center. Customizable: swap pecans for walnuts, raisins for chocolate chips. Great for dunking in milk. Can be frozen for up to 2 months. Pumpkin Cinnamon Rolls with Cream Cheese Frosting – if you love cinnamon rolls and pumpkin, then you are going to devour these cinnamon rolls! My family has requested them time and again these last few months. Worth every calorie – promise! 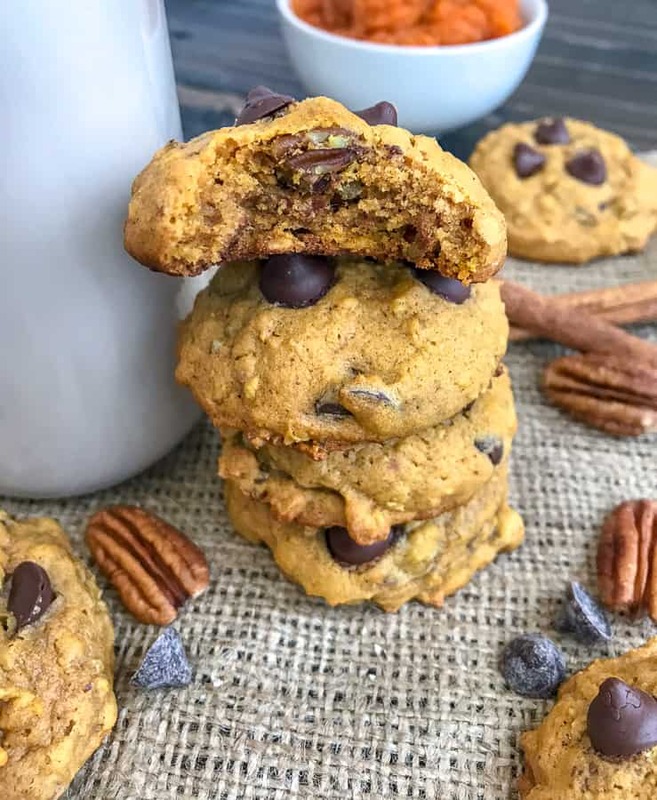 Pumpkin Cake Cookies – this is the recipe these Chocolate Chip Pumpkin Pecan Cookies stemmed from! If you’re a cake fan, then you will love these Pumpkin Cake Cookies. They are incredibly soft, moist, and chewy – just like cake! With the best cream cheese frosting imaginable. Garlic Roasted Asparagus Au Gratin – looking for the perfect side dish to serve on your holiday table with your ham or turkey? Try this version of au gratin asparagus! Roasted Balsamic Brussels Sprouts – another delicious side dish for your holiday feasts. Full of sweet, yet savory, flavors and very easy to make. Honey Roasted Butternut Squash – a yummy, sweet and savory side dish that will wow a crowd! Currently one of the most remade side dishes on my blog. Ice Cream Scoop with Trigger – this is very similar to the one that I have. Mine is technically a melon scooper, but in all honesty — they work the same! So if you have a cookie scoop, small ice cream scoop or a melon scooper, I recommend using that for creating even-sized cookies. Incredibly easy and incredibly delicious cookies that are crispy on the edges, yet soft and chewy in the center - just like a cookie should be! 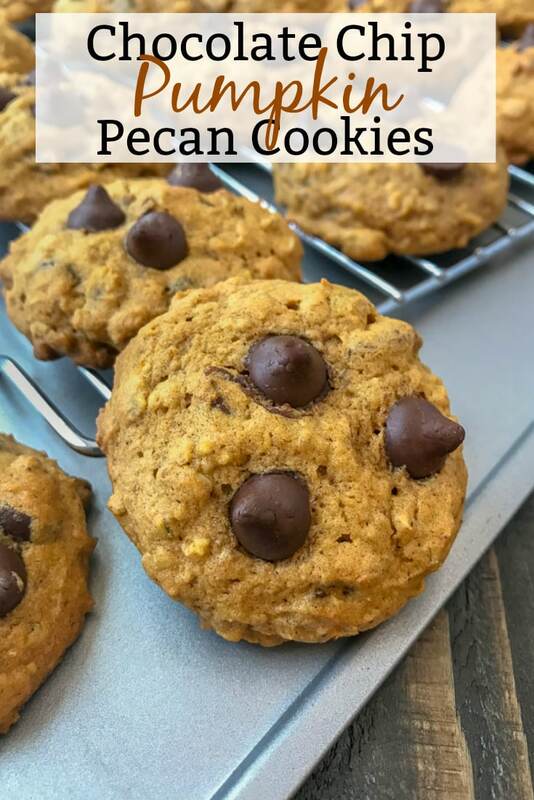 These Chocolate Chip Pumpkin Pecan Cookies are loaded with oats, chocolate chips, and pecans, with the perfect amount of pumpkin flavoring! To a separate mixing bowl, combine the flour, oats, baking powder, baking soda, salt, and pumpkin pie spice. Slowly add the flour mixture to the wet ingredients 1/4-1/2 cup at a time. Mix well. Using a spatula, fold in 2/3 cup of the chocolate chips and all of the crushed pecans. Fold gently to mix both through the batter. 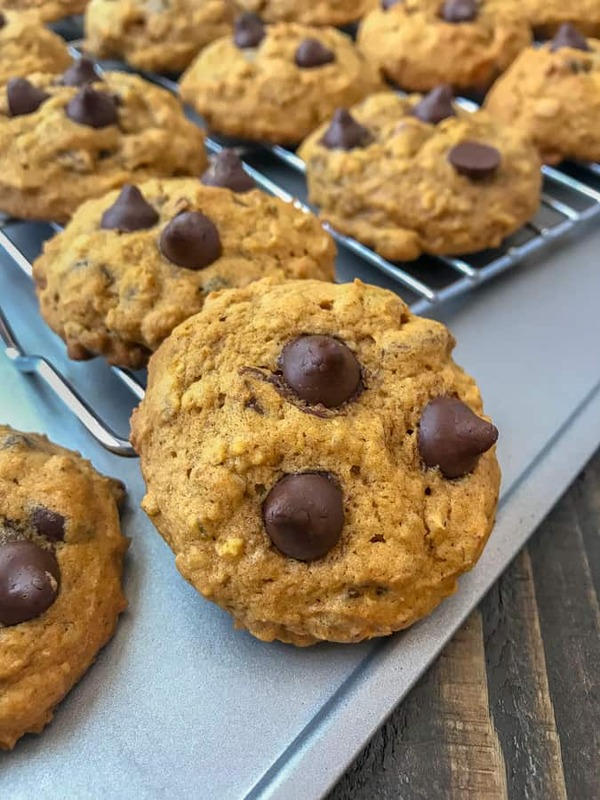 Using a 2-tablespoon scoop (melon scooper or cookie dough scoop), release the batter onto the baking sheets, making sure to keep each cookie 2 inches apart. Add 2-3 chocolate chips (of the remaining 1/3 cup) to each cookie, pushing each chip in slightly so it doesn't melt off while baking. Bake for 10-12 minutes, or until the tops are firm. They will feel slightly underdone in the center, but brown on the edges. The cookies will continue to cook a bit once out of the oven and resting. Transfer the cookies to wire racks to cool. Amount of cookies baked will vary. My calculations using a 2-tablespoon scooper, such as what is listed and linked in my blog post, gave me 42 cookies total. I filled the scoop and ran it along the edge of the bowl to level off prior to dropping it onto the baking sheet. If you end up with less cookies or more than 42, simply take the nutritional breakdown in the label below and multiple it by 42 (the number of cookies I made) to get the entire recipe breakdown, and divide it by the number of cookies you ended up with. This will give you the exact nutrition breakdown per cookie.